Welcoming home town signage greets visitors to Beach as they travel Highway 10, once the main east-west thoroughfare in the area. There’s a small town on the edge of western North Dakota, nearly in Montana (it once was part of Montana), which holds a few hidden treasures! Knowing we’d make an investigative visit there, I used social media to ask local folks for more information, especially about eateries. Food is near the top of the list for us when we travel! Buzzy Cafe is a welcoming, popular gathering place in Beach, North Dakota. And the food is good! Where To Eat In Beach? The top two places recommended by people of the Beach area were Buzzy Cafe and Park Cafe. We decided to try them in alphabetical order. Buzzy it was. Easy to find, plenty of parking. The eclectic decor of Buzzy Cafe might just make it seem like home! Initial impressions set the stage for any experience. From our first look of things, we’d be having a good experience! This was a home town establishment, not part of a chain. I was especially taken by the tables and chairs. Chrome. Vinyl. Memories evoked, and good ones! I could almost smell my mom’s cooking. Oh, but wait! Those smells were coming from the kitchen here at Buzzy Cafe. I knew I was gonna like this place. Thumbs up! Choose either a booth or a table in comfortable surroundings at Buzzy Cafe in Beach, North Dakota. Surroundings are important. Of equal importance is how the employees of an establishment treat you once you walk in the door. We were greeted shortly after we sat in our booth, and not in a hurried way. Our waitress was friendly, not adverse to making eye contact and engaging in conversation. Efficient, too. Water, coffee and menus on the table pronto. Enjoy a hearty breakfast any time at Buzzy Cafe in Beach, North Dakota. The selections are many! The menu was more extensive than I had imagined it would be, and the prices were reasonable. Enjoy Breakfast All Day, Sizzling Skillets, Hearty Breakfast Dishes (which include a Whiskey Sirloin with Cowboy Potatoes), Appetizers, Breaded Baskets, Salad Bar, and Burgers. A lot of burgers! And Sweeter Sides! The latter heading peaked my interest, and I could see by the selections prominently displayed on a white board that pie and ice cream in assorted flavors was important at Buzzy Cafe in Beach. Doughnuts, muffins, cookies, long johns, carmel rolls, cinnamon rolls and pie go great with coffee at Buzzy Cafe in Beach, North Dakota. Buzzy Cafe in Beach, North Dakota specializes in home made pies and cookies, as well as assorted ice cream flavors. Our visit to Beach and Buzzy Cafe came after a two day camping trip in the heart of the badlands, north of the Beach-Sentinel Butte area at what used to be Theodore Roosevelt’s Elkhorn Ranch. While our campfire cooking was perfect for our early morning breakfast, we craved food other than eggs and sausage, but something basic. A Chef Salad and a Mushroom & Swiss Burger it was. In short time, we were delving into our first meal at Buzzy’s. How was it? It Hit The Spot! The hamburgers are made by hand and the salads are substantial at Buzzy Cafe in Beach, North Dakota. We got what we were craving. We’ll go back, next time earlier in the day. A hearty breakfast, or mid morning pie and coffee sounds superb! Buzzy Cafe’s is open seven days a week with varying hours (which may change in winter). Keep in mind that it closes at 2 pm on Mondays and Tuesdays. Keep up to date with Beach’s Buzzy Cafe by checking out their Facebook group here: The Food is Good At Buzzy Cafe! Buzzy Cafe is open a variety of hours, winter hours may vary. Coming soon, Park Cafe in Beach. What a surprise it turned out to be! Experience beautiful fall foliage in the North Dakota Badlands! Click here: North Dakota badlands color! Adventurous? Check out fall colors at this badlands crossing….. if you dare! The Devil Passes Here! Find out about Places to Go and Things to Do! Subscribe to our blog in the upper right-hand corner of this page. 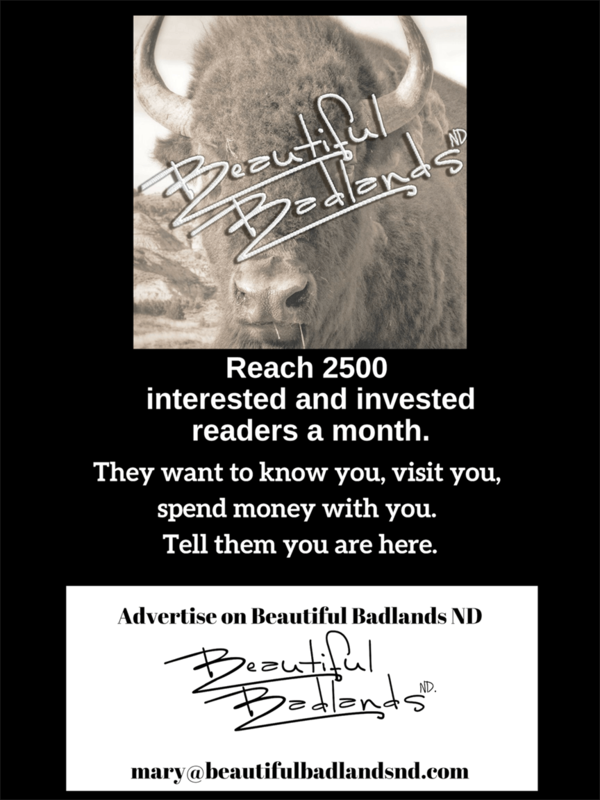 Writers at Beautiful Badlands ND provide photos, content and historical research that counties and cities use to promote themselves.